GLENDORA — Bonita High School has shown the ability the past few seasons that when it’s backed into a corner, it can attack like a cat and live for another day. This time, the Bearcats just got mauled. James Nolan rushed for 219 yards and three touchdowns and Bryce Wooldridge accounted for 273 yards and four scores as Glendora stayed perfect in the chase for the Palomares League football title with a 56-20 victory over Bonita at Citrus College. Wooldridge threw for 199 yards for the Tartans (4-4, 3-0). Dylan Flores had 87 yards receiving and a touchdown for Bonita (3-5, 0-3). The Bearcats’ playoff hopes have gone from slim to almost nil. Glendora plays at Ayala next week. 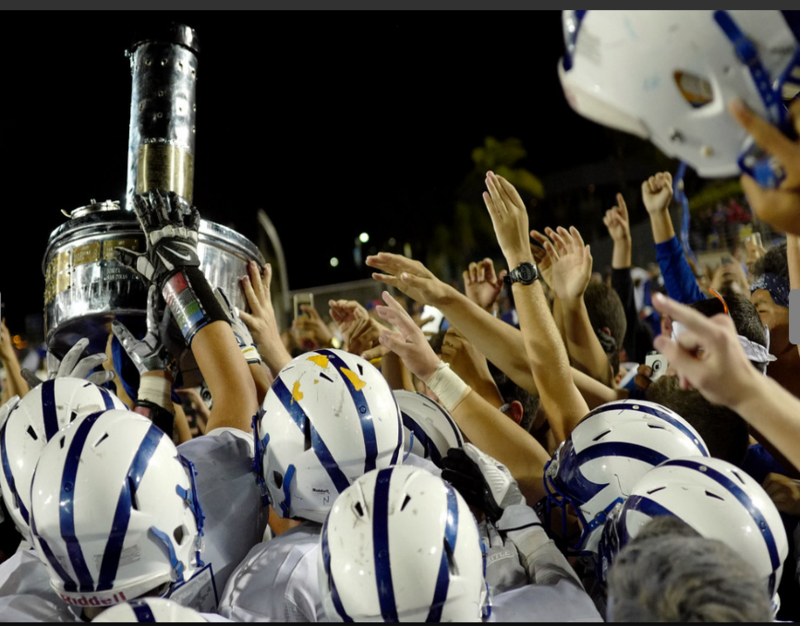 The Bulldogs (3-4, 2-0) have a home game against Claremont on Friday. Glendora started fast and finished the first half strong to lead, 35-20, after two quarters. James Nolan rushed for 125 yards and two touchdowns during the first half as the Tartans scored on five of their eight possessions to start the game. 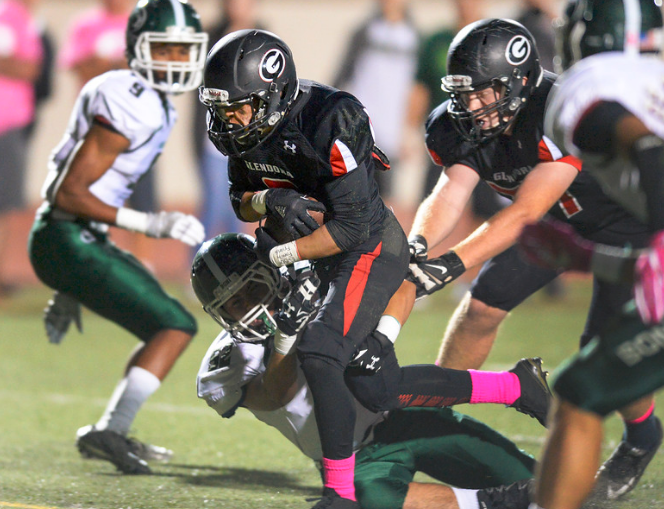 Glendora gained 320 yards during the first two quarters. LA PUENTE — Nogales High School dominated the lines of scrimmage and cruised to a 58-0 win over Workman in a game played at La Puente High on Thursday night. The Nobles (7-1, 2-1) took over sole possession of second place in the Montview League football standings, half game behind first-place Duarte. Quarterback Matt Olguin led the Nobles offense, completing 14 of 16 passes for 197 yards and five touchdowns, all in the first half. Olguin threw three touchdown passes to James Gray and a pair to Larenzo Williams. Andrew Carrazco ran for another TD in the first half. Williams intercepted a pass in the second half and returned it 60 yards for a score. It was his third interception of the season. The Nobles offensive line of Chris Espinoza, Christian Flores, Leo Gonzalez and brothers Jonathon and Juan Guardado gave Olguin time to throw and opened holes for Gray and Carrazco to pile up 297 yards of offense in the first half while holding the Lobos (3-5, 1-2) to just 40 yards of offense. Garey 15, Pomona 3 — The Vikings won the Miramonte League title by defeating the Red Devils. Garey finished the regular season 19-1 overall, 15-0 in league. The Vikings will advance to the league prelims on Tuesday at The Claremont Club. Gladstone 12 1/2, Duarte 5 1/2 — Joey Marquez and Erika Rios Aguilar swept in singles for the Gladiators, who won the Montview League title. Marquez finished the regular season 30-0. West Covina 11, Los Altos 7 — Taylor Valenzuela and Nicole Villa swept in singles for the Bulldogs in a Hacienda League victory. Valenzuela finished the regular season 30-0. Bonita 5, Westlake 0 — Kaylee Singleton scored twice and Kira Martinez, Katie Wearp and Michelle Boulware each scored a goal for the Bearcats (9-4-2, 5-3) in a Sunset League North victory. Glendora 2, Chaminade 1 — Tori Rood and Sophie Walker both scored a goal for the Tartans in a Sunset League North win. Duarte 3, Nogales 1 — Jocelyn Portillo and Ana Morales both had 16 kills and Lauryn Higginson and Emily Lopez both had six kills for the Falcons (16-10, 7-2) in a 24-26, 25-16, 29-27, 25-17 Montview League victory Wednesday. Dionne Zhao had four aces and 30 assists for Duarte. Diamond Ranch 3, Walnut 2 — Maria Pinedo had nine kills and Morgan Hendeson and Ayana Mier both had seven kills for the Panthers (7-9, 3-4) in a 21-25, 16-25, 25-9,. 25-15, 15-9 Hacienda League win Wednesday. It’s league showdown time for many teams in quests for championships as the regular season wind down. Four Top 10 teams face that scenario. Los Altos makes its first appearance in the Top 10. Palomares League individuals — Diamond Bar’s Kailie Vongsaga won the league title with a two-day score of 143. Amanda Row of Chino Hills shot a 151. Diamond Bar’s Angelica Kusnowo shot a 152, Crystal Wang shot 153 and Ester Lee shot a 162. The top nine finishers advanced to the CIF Southern Section individuals qualifier on Tuesday at Dad Miller Golf Course in Anaheim. Gabrielino 3, South El Monte 0 — Leslie Rivera had 11 kills and three aces and Audrey Kuptz had four kills and four blocks for the Eagles (22-3, 10-0) in a Mission Valley League victory. El Monte 3, Mountain View 0 — Giselle Alarcon had 12 kills and Lorena Lopez had 17 assists and seven aces for the Lions (16-5, 7-1) in a 25-18, 25-20, 25-23 Mission Valley League win. West Covina 3, Chino 1 — Alexsis Rodriguez had six aces, Julia Trujillo had 21 digs and Makaila Montello had nine kills for the Cowgirls in a 25-14, 25-23, 20-25, 25-18 Hacienda League loss. Glendora 3, Ayala 0 — Alex Lowden had 11 kills and 17 digs and Marissa Montoya had nine kills and 21 digs for the Tartans (24-3, 9-0) in a 25-21, 25-18, 25-20 Palomares League win. Emma Svagdis had seven kills for Glendora. Northview 3, San Dimas 1 — Julia Hooper had 10 digs, Kaylee Sadler had 12 digs and 17 kills and Daisy Valdez had nine digs, four aces and six kills for the Vikings (17-7, 7-1) in a 25-21, 22-25, 25-20, 25-21 Valle Vista League win. Duarte 3, Sierra Vista 0 — Jocelyn Portillo had 12 kills, three aces and nine digs and Ana Morales had eight kills for the Falcons (15-10, 6-2) in a 25-17, 25-15, 25-19 Montview League win Monday. Also contributing to Duarte’s victory were Dionne Zhao, who had 22 assists and two aces, and Lauryn Higginson, who had three blocks. Diamond Ranch 3, Charter Oak 1 — Morgan Henderson had 11 kills, Desiree Fang had five aces and Vicki Zaluske had 22 digs for the Panthers (7-9, 3-4) in a 25-22, 20-25, 25-18, 26-24 Hacienda League victory Monday. Los Altos 3, Chino 0 — Jaylen Farias had nine digs and two aces and Julia Trujilo had three kills and 18 digs for the Cowgirls in a 25-12, 25-20, 25-13 Hacienda League loss Monday. Makailia Montello had seven kills and three blocks for Chino. Garey 17, Bassett 1 — The team of Sunita Bohara and Lisbet Flores swept in doubles and Melody Sanchez and Wendy Romero swept in singles for the Vikings (18-1, 14-0) in a Miramonte League match. Garey has won 18 straight matches. Chino 13, West Covina 5 — Taylor Valenzuela swept in singles for the Bulldogs in a Hacienda League loss. Diamond Ranch 12, Charter Oak 6 — Beatriz Ponce, Katelyn Su and Diana Godinez swept in singles for the Panthers (5-3) in a Hacienda League match Monday. Camino Real League Prelims — The top 16 finishers of the day advanced to the league finals Thursday. Bishop Amat’s Sharon Chen led the way at 41, Diana Delgado shot 42, Veronica Trujillo shot 46 and Alyssa Ruiz shot 52. La Salle’s Makenna Hicks shot 54, Victoria Tong and Sarah Day both shot 56 and Annabell Lee shot 61. St. Paul’s ReAnna Gonzales shot 60, Jessica Kirk shot 62 and Angelina Perez shot 65.